19th century author Lewis Carroll has a lot to answer for; he wrote Alice’s Adventures in Wonderland in 1865 and that’s a children’s book which has since become an enduring classic. It’s a fascinating read full of wildly inventive characters and it’s about time a company such as Random Logic used it as a theme for an online slot. 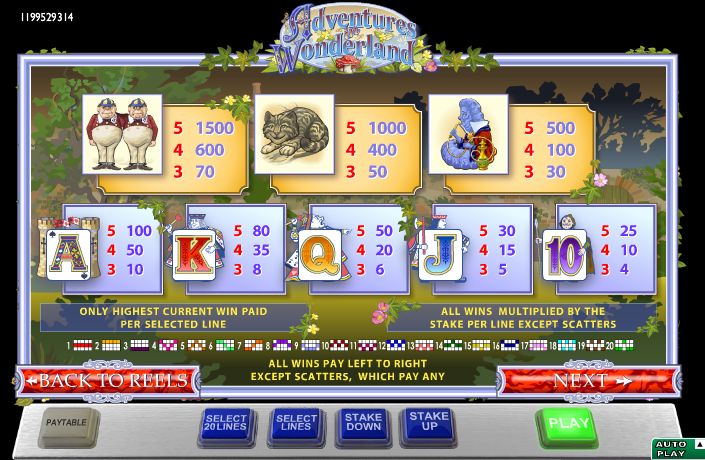 Alice’s Wonderland looks and sounds great – it’s a five reel and twenty payline slot full of colour and charm and to top it all there’s a gigantic progressive jackpot to win. The design is best described as ornate and the major symbols are characters from the tale and include the bong-smoking caterpillar, the cheshire cat and the twins, Tweedledum and Tweedledee. The minor symbols are playing cards and they are of course appropriate in this setting. Land three of the Mad Hatter symbols anywhere on the reels and the Tea Party game will activated. All you have to do is pick from the selection of guests on the screen to serve them tea; the more they drink the more you win. Carry on picking guests until the game is over. The progressive jackpot is also won while playing this game and it’s a random award – if the spoon in the sugar bowl serves sugar to the guests you are a winner! The Rabbit Hole symbol only appears on the middle reel and if you land it you’ll trigger the Rabbit Hole bonus; all you do is watch as Alice falls down the hole, collecting cash prizes as she goes. The game is over when she hits the bottom. Three White Rabbit scatter symbols anywhere on the reels will activate the free spins; the first thing you’ll be asked to do is spin the hand on the pocket watch to reveal the total number of spins. Now the White Rabbit will jump across the reels, leaving between three and five sticky wilds. Sticky wilds remain i place until the round is over. The free spins can now get underway with some slightly improved reels but none of the bonuses can be triggered from this phase. 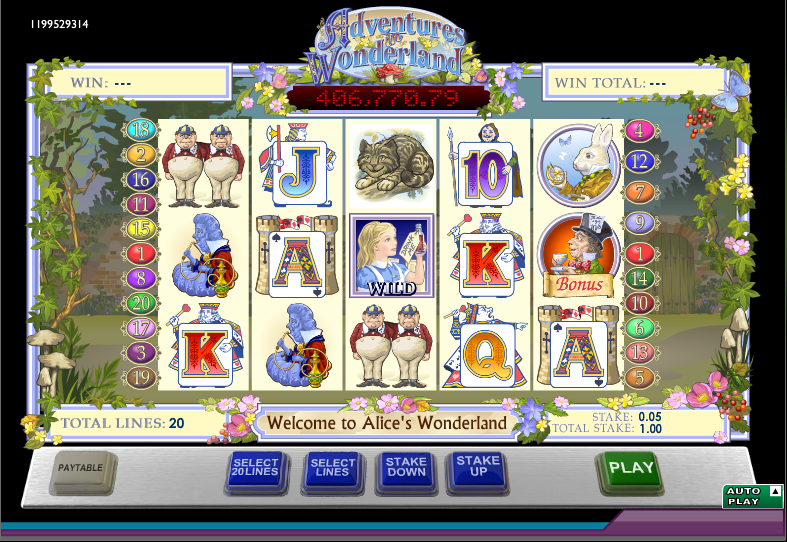 Alice’s Wonderland is a beautifully-designed game with a variety of bonus features; the characters look as though they are straight from the pages of an illustrated book. Add a nice soundtrack and a progressive jackpot and this is game to check out.